Carleton E. Watkins (1829–1916) was an American photographer of the 19th century. Born in New York, he moved to California and quickly became interested in photography. He focused mainly on landscape photography, and Yosemite Valley was a favorite subject of his. His photographs of the valley significantly influenced the United States Congress’ decision to preserve it as a National Park. 2.5 Taber and "New Series"
Carleton E. Watkins was born on November 11, 1829, the eldest of eight children. His parents were John and Julia Watkins, a carpenter and an innkeeper. Born in Oneonta, New York, he was a hunter and fisherman and was involved in the glee club and Presbyterian Church Choir. His true middle name is the subject of debate: some sources give it as Eugene while others give it as Emmons. In 1851, Watkins and his childhood friend Collis Huntington moved to San Francisco with hopes of finding gold. Although they did not succeed in this specific venture, both became successful. Watkins became known for his photography skills, and Huntington became one of the “Big Four” owners of the Central Pacific Railroad. This would later be helpful for Watkins. During the first two years in San Francisco, Watkins did not work in photography. He originally worked for his friend Huntington, delivering supplies to mining operations. He did this before working as a store clerk at a George Murray’s Bookstore, near the studio of Robert H. Vance, a well-known Daguerreotypist. An employee of Vance’s unexpectedly left his job, and Watkins’ agreeable personality led to his looking after the studio. Before his work with Vance, Watkins knew nothing about photography. Vance showed him the basic elements of photography, planning to return and retake the portraits himself. However, when he came back, he found that Watkins had excelled at the art while he was away and his customers were satisfied. By 1858, Watkins was ready to begin his own photography business. He did many commissions, including “Illustrated California Magazine” for James Mason Hutchings and the documentation of John and Jessie Fremont’s mining estate in Mariposa. He made Daguerreotype stereoviews (two nearly identical images of the same scene, viewed through a stereoscope to create an illusion of depth) at the “Almaden Quicksilver Mines.” These were used in a widely publicized court case, which furthered his reputation as a photographer. In July 1861, Watkins made the decision that changed his career: he traveled to Yosemite. He brought his mammoth-plate camera (which used 18x22 inch glass plates) and his stereoscopic camera. The stereoscopic camera was used to give the subject depth, and the mammoth-plate camera was used to capture more detail. The photographer returned with thirty mammoth plates and one hundred stereoview negatives. These were some of the first photographs of Yosemite seen in the East. 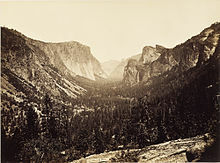 In 1864, Watkins was hired to make photographs of Yosemite for the California State Geological Survey. In 1867, Watkins opened his first public gallery, in addition to sending his photographs to the Universal Exposition in Paris, where he won a medal. This became his lavish Yosemite Art Gallery. He displayed over a hundred large Pacific Coast views in addition over a thousand images available through stereoscopes. Despite his success as an artist, he was not successful as a businessman and ended up losing his gallery to his creditor J.J. Cook. Watkins met Frances Sneed photographing in Virginia City, Nevada. They became romantically involved in 1878 and were married a year later, on Watkins’ fiftieth birthday. The couple had two children: a daughter Julia in 1881, and a son Collis in 1883. Watkins began to lose his sight in the 1890s. His last commission was from Phoebe Hearst to photograph her Hacienda del Pozo de Verona. Watkins was unable to complete this job because of his failing sight and health. In 1895-96, his lack of work led to an inability to pay rent. The Watkins family lived in an abandoned railroad car for eighteen months. Watkins kept the majority of his work in a studio on Market Street. This studio was destroyed in the 1906 San Francisco earthquake and fire, with countless pictures, negatives and the majority of his stereo views. After this horrific loss, he retired to Capay Ranch. Three years after Watkins retired to Capay Ranch, he was declared incompetent and put into the care of his daughter Julia. She cared for him for a year before committing him to the Napa State Hospital for the Insane in 1910, at which point Frances Watkins began referring to herself as a widow. Watkins died in 1916 and was buried in an unmarked grave on the hospital grounds. Watkins often photographed Yosemite and had a profound influence over the politicians debating its preservation as a national park. His photographs did more than just capture the national park; he created an icon. Half Dome, for example, did already exist, but Watkins’ photographs brought it to people in a way that they could experience it. It became iconic through his photographs, became something people wanted to see in person. His images had a more concrete impact on Yosemite becoming a national park than just encouraging people to visit. It is said that Senator John Conness passed Watkins’ photographs around Congress. His photography was also said to have influenced President Abraham Lincoln and was one of the major factors in Lincoln signing the Yosemite Grant in 1864, a bill that declared Yosemite Valley inviolable. The bill paved the way for the 1872 creation of Yellowstone National Park, and the U.S. National Park System in its entirety. One of Yosemite’s many mountains is named Mount Watkins in honor of Watkins’ part in preserving Yosemite Valley. The 1864 bill signed by Lincoln is often seen as the beginning of environmentalism in American politics. 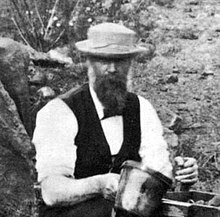 In accordance with his influence in preserving Yosemite and the beginning of the National Parks system, Watkins is seen as an important part of that. His photographs captured nature in a way that caught the eye of Americans. He created sublime images of wilderness, pristine landscapes untouched by humans. These images established icons that furthered environmentalist ideals, helping to back claims about preservation. Watkins photographed one of the giant sequoia trees in California, the “Grizzly Giant.” His photo was created with one of his mammoth plates, which allowed him to photograph the entire tree, which had not been done before. Watkins, in addition to creating an image not seen before, was already very well known, and the image rapidly gained fame. Despite the fact that Watkins was attempting to preserve the trees, the way his photograph captured American audiences led to an increase in tourism in the area, which led to larger commercialization, which led to a diminishing of the giant sequoias. ^ a b c d e f g h i j "National Gallery of Art - Carleton Watkins: The Art of Perception". Archived from the original on 2005-03-04. Retrieved 2005-03-02. ^ Palmquist, Peter E. (1983). Carleton E. Watkins, Photographer of the American West. Amon Carter Museum. p. 3. ISBN 9780826306593. ^ a b c d e f "Welcome to the Photographs of Carleton Watkins". ^ a b c d e f g "Carleton E. Watkins". ^ "Carleton E. Watkins (Getty Museum)". Archived from the original on 2010-12-04. Retrieved 2007-06-06. ^ "Phoebe A. Hearst Museum of Anthropology". Archived from the original on 2005-03-20. ^ a b DeLuca, Kevin Michael; Demo, Anne Teresa (2000). "Imaging Nature: Watkins, Yosemite, and the Birth of Environmentalism" (PDF). Critical Studies In Media Communication 17, no. 3: 241. Academic Search Complete, EBSCOhost. Archived from the original (PDF) on April 2, 2015. Retrieved October 16, 2014. ^ Hutchinson, Elizabeth (2004). "They Might Be Giants: Carleton Watkins, Galen Clark, and the Big Tree". October no. 109: 46-63. Academic Search Complete, EBSCOhost. JSTOR 3397659. Green, Tyler (2018). Carleton Watkins: Making the West American. University of California Press. p. 592. ISBN 9780520287983. Kurutz, Gary F. (2006). "Yosemite on Glass". In Scott, Amy (ed.). Art of an American Icon: Yosemite. Autry National Center. ISBN 978-0-520-24922-6. Naef, W; Wood, J & Heyman, T (1975). Era of Exploration: The Rise of Landscape Photography in the American West, 1860-1885. New York: The Metropolitan Museum of Art. Palmquist, Peter E. (1983). Carleton E. Watkins: Photographer of the American West. University of New Mexico Press. ISBN 0-8263-0659-4. Wikimedia Commons has media related to Carleton E. Watkins.